Region: Throughout North America and Europe. Life cycle: This insect produces numerous generations each year. 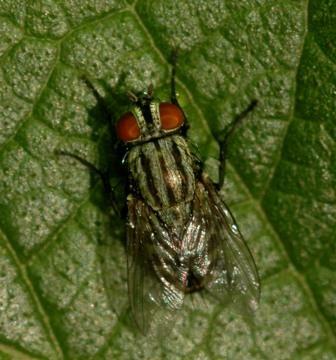 Physical Description: These flies superficially resemble the House Fly, except for the red eyes and there are three black strips on the thorax, rather than two or four. The adults are black to grayish in color and .35 to .4 inches long. Feeding characteristics: These beneficial flies have various habits. Some scavenge in decaying flesh and the dead bodies of insects. Some are internal parasites of insects or predaceous upon their eggs. Many of the females deposit living larvae rather than eggs. Locusts, Grasshoppers, and many kinds of Wasps are parasitized. They are usually abundant in urban areas, but rarely enter houses.